Keeping small items separated in your carry-on bag is an art, one that I am not particularly skilled at doing on a regular basis. The Lug Clearview envelopes are a stylish way to keep things organized. Clear Sides To Easily Identify Contents. The bags are great for TSA-approved toiletries (although many overseas airports, we are looking at you London Heathrow, still force you to use their oblong plastic bags). I like the fact that these bags zip open and close to keep things contained (plastic bags can sometimes leak or open) and that they come in multiple sizes. Beyond toiletries, these bags are great to separate things like keys, pens, club lounge or frequent flier cards, and medicine. I also like to use them to keep foreign currency separated within my bag and grab it in a hurry, which is helpful when traveling within countries. The bottom of the clear bags have colorful, soft cushioning with geometric stitching that helps to keep the contents safe. But, the soft base also has another purpose because I can easily reach for things within my bag based upon color codes. 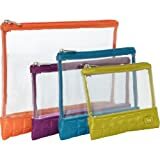 These are also great for families traveling with small toys, coloring supplies, or even snacks.The plastic of the bags interior and exterior is easy to wipe clean, and they can even be gently washed on the inside. They are both lightweight and durable plus they come in sets of two or four. An adjustable shoulder strap is also available to carry it as a small purse or travel bag with passport and other necessary security documents. This is a simply, practical idea that adds a bit of vibrancy to otherwise mundane organization. They retail for $20 for two or slightly more for larger sets and are available on Amazon.